It may be apple season, but there still is a chance to pick up corn on the cob at the farmers’ markets around here. We always buy a dozen ears. And sometimes we have leftovers. Especially when I make the mistake of buying cheap corn on the cob at the grocery store in between farmers’ market runs. Those 15 cent ears simply were not in the same league as locally grown, freshly picked corn. What do you do with leftover bargain corn that no one wants to eat? Make a light and tangy relish with it, that’s what! This recipe was inspired by a corn salad recipe I found in the book Balaboosta, by Einat Admony. And the colorful medley would be even more delicious with premium corn on the cob. But we (including all the kids) gobbled up the cheap corn relish in any case. It’s amazing what a splash of vinegar can do! 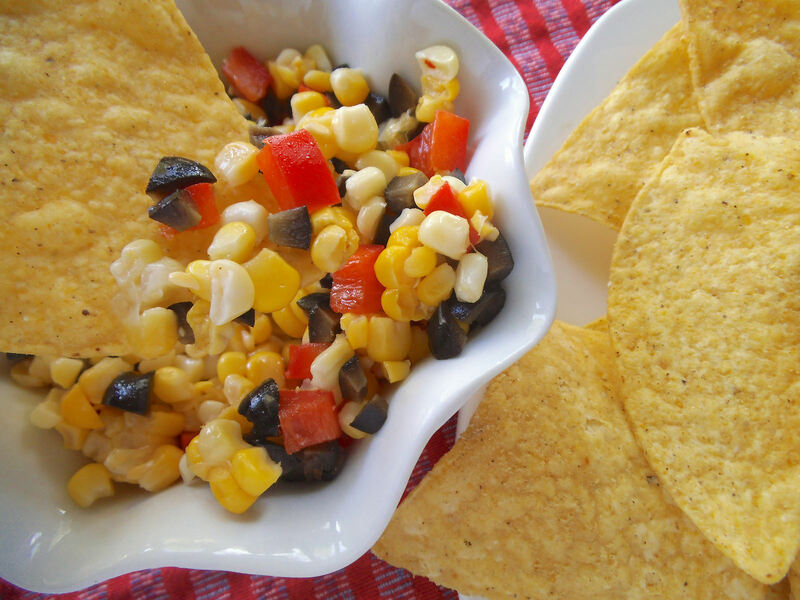 We enjoyed this light corn relish with corn tortilla chips, but it also makes a great taco topping. Feel free to use it in place of pico de gallo with other foods too! Whisk together the vinegar, oil, sugar, and salt. Toss the mixed dressing with the corn, red bell pepper, and olives. Serve relish chilled or at room temperature. Sweet and simple. I’d also add some diced jalapeño for a bit of kick! 🙂 thanks for sharing! Absolutely! It’s a great relish on its own, but jalapeño or cilantro would be a nice touch too!